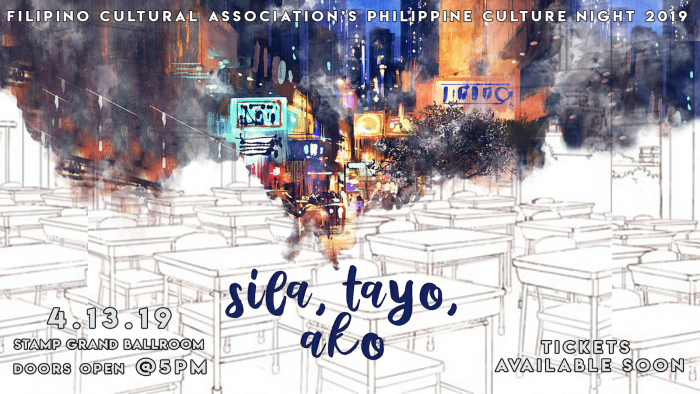 This year’s PCN Sila, Tayo, Ako follows a young man, Aiden on his journey to reconcile with his girlfriend, Diana, but finds himself struggling to overcome his internalized insecurities. Through several difficult, yet comedic, obstacles, he eventually learns important lessons about the expectations put upon men in the Asian-American community. PCN is a play that is written, directed, choreographed, acted, danced, and produced by FCA general body members. PCN embodies FCA's mission to educate, advocate, enlighten culturally, and promote Filipino and Filipino-American culture. The event features modern and cultural dances, our renowned a cappella ensemble The Mezzopinoys, and the presentation of the 2019 FAST Bayani Award, an award celebrating an individual that has demonstrated exemplary acts to our members throughout their time as part of FCA.